It looks like Microsoft is going to launch a special edition version of the Xbox One S soon. This version of the console will be a Minecraft edition and if the leaked images are true, the console’s paint job will make it seem like it came right out of the game itself. This special edition of the console will have Minecraft blocks etched right into the Xbox One S. Fans are sure to love it. 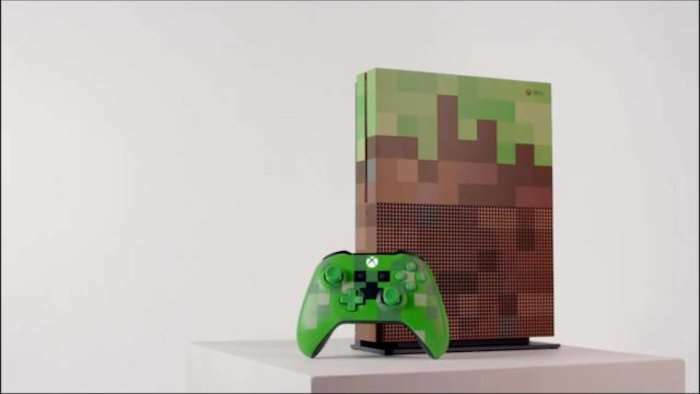 This upcoming special edition of the Xbox One S was spotted by an Italian blog that spotted a video promo for the console on an official Minecraft Facebook page. It’s likely that Microsoft will announce this edition officially anytime now at its Gamescom event. We don’t have any other information about the Minecraft special edition version of the Xbox One S right now. Hopefully we will learn more very soon. Most likely the changes are only going to be cosmetic, otherwise the consoles specs will remain the same. We will hopefully have more information about pricing and availability soon. If you love Minecraft you will want to get your hands on one of these special edition consoles so you can admire it all day long.